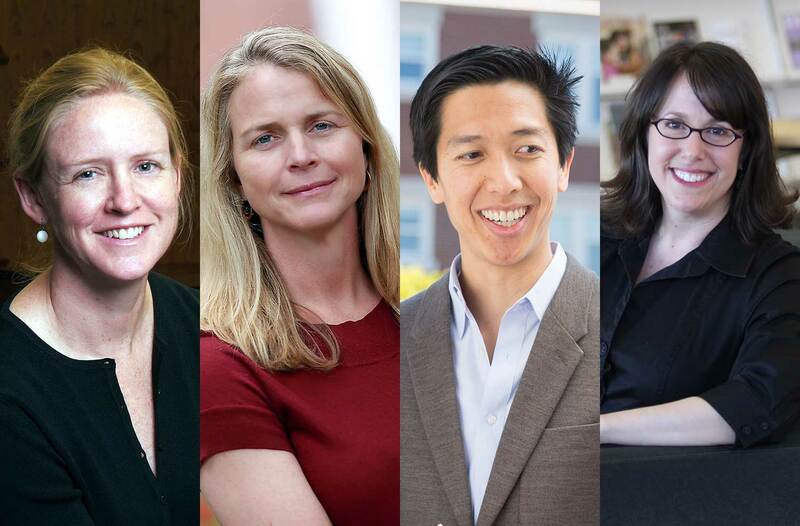 Four faculty members at the Harvard Graduate School of Education have recently been awarded named chairs. Dean Bridget Long has announced that four faculty members have been awarded named faculty chairs: Stephanie Jones, the Gerald S. Lesser Professor in Early Childhood Development; Meredith Rowe, the Saul Zaentz Professor of Early Learning and Development; Mandy Savitz-Romer, the Nancy Pforzheimer Aronson Senior Lecturer in Human Development and Education; and Andrew Ho, the Charles William Eliot Professor of Education. The Charles William Eliot Professorship is intended to honor researchers in the broad field of education. The awarding of the chair recognizes Ho’s impactful and highly regarded contributions to the HGSE community and to the field of education. His work as a psychometrician aims to improve the design, use, and interpretation of test scores in educational policy and practice, and he is known for documenting the misuse of proficiency-based statistics in state and federal policy analysis. Ho advocates for evaluative metrics to achieve multiple criteria, with the goal of improving accuracy and transparency, specifically to their target audiences. Ho is a member of the National Assessment Governing Board that sets policy for the National Assessment of Educational Progress. The Gerald S. Lesser Professorship in Early Childhood Development is an endowed chair with the intent of advancing the study of human development from infancy through school age. The Lesser chair fits Jones’ commitment to understanding human development in early learners and creating interventions that directly affect practice. Through her research, anchored in prevention science, Jones examines the effects of poverty and exposure to violence on young people’s social, emotional, and behavioral development. Over the past 10 years, her work has centered on the impact of preschool and elementary-focused social-emotional learning interventions on behavioral and academic outcomes and classroom practices, as well as new curriculum development, implementation, and testing. Jones is co-director of the Saul Zaentz Early Education Initiative at HGSE. The Saul Zaentz Professorship of Early Learning and Development is part of the broader Saul Zaentz Early Education Initiative at HGSE, with the endowed chair providing intellectual leadership for an agenda of powerful research that will influence the field of early childhood education. Rowe’s research aims to better understand the role of parent and family factors in children’s early language and literacy development. She is interested in uncovering how variations in children’s early communicative environments contribute to language development and how to apply this knowledge to the creation of intervention strategies for low-income families. The Nancy Pforzheimer Aronson Chair in Human Development and Education is designed to promote the broad study of human development and its connection to education. Savitz-Romer’s work examines how schools structure counseling systems and college planning efforts to support all students, specifically exploring college access and retention, early college planning and awareness, school counselor development, and school-university partnerships. Her 2012 book Ready, Willing and Able describes how an understanding of adolescent development can be used to advance college access efforts. She is director of the Prevention Science and Practice master’s program at HGSE.